The OM-320 portable data logging system consists of the OM-320 system base, a choice of plug-in interface modules and icon-based Windows software. Several optional accessories including modem modules and PCMCIA data memory modules are also available. The OM-320 system base is a latching weatherproof enclosure containing the microprocessor, data storage memory, analog to digital converter, liquid crystal display, batteries, input/output terminal strip connector and six interface ports that accommodate the interface modules and accessories. The system base is programmed for operation via the included Windows based software. Simple to complex programming is readily implemented by developing the program visually on the PC by dragging and dropping icons and interconnections, then transferring the program via RS-232 or modem to the OM-320 memory before deployment. Alarming, conditional logging, algebraic data manipulation and a multitude of other functions are easily accomplished with this visual programming software. Six interface ports, providing up to 24 analog and/or digital channels are accessible by removing two thumbscrews and lifting the hinged OM-320 front panel. Each port can accept interface modules ranging from four channel universal Vdc modules (software configurable for six thermocouple types, 15 ranges of volts dc or amps dc) to four channel digital I/O modules (software configurable for frequency, event, counter input, digital output), to PCMCIA data memorymodules, to 14.4 KBaud modem modules and more. Designed for portable, plant floor and long-term remote data collection applications, the OM-320 incorporates low power CMOS circuitry and extensive energy conserving circuitry. The OM- 320 will run for up to one month from its six internal alkaline D-cells. The D-cells are readily accessible in a lid mounted battery holder providing for quick and easy field replacement. For longer term logging applications, low voltage external power can be directly connected to the system base. In the event of external power failure, the OM- 320 will automatically transfer to the internal batteries provided uninterrupted logging. The OM-320 front panel includes user control buttons for Enable, Stop, System Status display, Power and Output Relay override. Additionally, a two-line liquid crystal display is provided for real-time data display of actual and calculated input signal readings as well as providing detailed system status reporting ranging from battery state of charge to current mode of operation to display of user programmed alarm messages. Front panel LEDs can be user programmed for status and alarming applications. 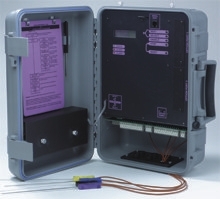 Included in each OM-320 system base is a general purpose digital input that provides a user programmed event or counter input, two alarm relay outputs, three TTL level digital alarm outputs and a cold junction compensation sensor for thermocouple measurements or general purpose temperature input. Input and output wiring is uniquely handled through the use of a terminal strip adapter (TSA) board which allows for mass connection and disconnection of wiring while maintaining the integrity of the sealed enclosure. Through the use of the terminal strip adapter, an OM-320 can be quickly disconnected from its associated I/O wiring harness, moved to another site and reconnected to a new set of I/O wiring. Analog and digital interface modules allow for direct connection and data recording from a full spectrum of input signals and sensor types. Various modules provide excitation, filtering, transient protection, amplification and software codes as required by the connected sensor/transducer or sensed parameter. True differential inputs with precision instrumentation amplifiers insure high signal to noise ratio performance. Special function interface modules available include modem interface modules and PCMCIA memory card modules. Modem interface modules incorporate FCC approved modems supporting direct telephone line connection for remote interrogation and control of the OM-320 as well as advanced functions such as alarm paging. The PCMCIA memory card interface module allows for data collection to a removable "credit card style" memory module. This memory card provides massive data storage capability and can easily be removed and replaced in the field. Interface modules plug directly into one of the six interface module ports in the system base logger allowing for standard I/O wiring through the terminal strip adapter on the system base logger. Each interface module contains encoded information for immediate self-configuration. Upon installation of the interface module into the OM-320 system base, the microprocessor reads the module type and stores calibration information for use during readings. The interface modules are then configured for application and signal type via the icon based visual programming method in the OM-320 Windows software. Interface modules include front end completion circuitry, such as 4-20 mA burden resistors and voltage dividers, thus minimizing field requirements for interfacing real world signals. 1. Query the OM-320 for its current hardware configuration (installed modules and accessories) via a serial link connection. 2. Visually develop the OM-320 program by dragging and dropping icons onto the program development screen from the toolbar and add interconnection lines. Individual icons are configured by doubleclicking on the icon and completing the pop-down dialog box. Upon completion, save the program to disc and return to the communication screen. 3. From within the OM-320 communication screen, drag the created program icon from the virtual PC to the virtual OM-320. The program is automatically error checked and transferred to the OM-320's memory and is ready for deployment and data collection. After data has been acquired in the field by the OM-320 and downloaded to the PC via modem or RS-232 link, the software's powerful graphic data plotting tool can be used to graphically plot up to seven data channels vs. time. Data analysis is enhanced with mouse stroke zooming and a full spectrum of display options including X and Y-axis scaling and formatting, grids, cursor data display, symbols, instant min/max/average and integral view analysis and more. The OM-320 software also provides a real-time, scrolling display of data collected by the OM-320 on a serially connected PC screen. This is an extremely valuable tool for critical real-time process monitoring as well as serving as a quick method of checking on OM-320 I/O values and status. Complying with the Windows standard, plots generated from within the OM-320 software can be printed directly or saved as *.BMP files (Windows bit map format). The *.BMP plot can be seamlessly integrated into other Windows applications including word processors and spreadsheets allowing for powerful report generation. The software also includes additional post-processing options including collected data conversion to ASCII columnar (text) files and direct output to the Microsoft Excel spreadsheet format. 참고: Purchase system base plus desired interface modules. Comes with Windows software, RS-232C cable, RJ-11 to DB9 serial adaptor, fittings, six D-cell batteries, 115/230 Vac power adapter and operator's manual.